Dave DeVries, founder of The Monster Engine, was featured on CBS This Morning back in late April. The segment helped promote awareness and showcase artwork by local children. The award-winning Monster Engine lecture and workshop provides artists of all ages with the art experience of a lifetime. From weekend seminars to school assemblies, Dave DeVries' Monster Engine delivers an engaging, entertaining and thought-provoking journey through the imagination. The Monster Engine is an eleven year art project which has grown into an internet phenomenon. Released in June of 2005, The Monster Engine attracted 17 million hits in the first month and continues to get 1/2 million hits per month and is linked to over a 12,000 blogs worldwide--all on word of mouth with no advertising. What would a child's drawing look like if it were painted realistically? Visit the online store to purchase The Monster Engine book. Critics call The Monster Engine "An intriguing book....a creative thought provoking adventure, sometimes shocking and often ticklishly funny. " and "An incredible journey into the wildest place of all: a child's imagination." 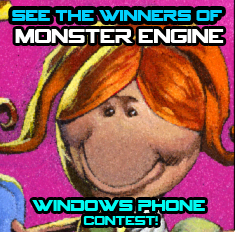 Please Note: The Monster Engine is only one person. I am not a big company that employs anyone. If anyone tells you otherwise then they are not being truthful. They do not work for me.